Fishing in Great Smoky Mountains National Park is allowed year-round, every day, from 30 minutes before until 30 minutes after official sunrise and sunset respectively. The park is one of the last habitats in the eastern US for wild trout. The park doesn’t stock fish, but with almost 3,000 miles of running water throughout the national park, there’s about 600 miles of streams supporting wild trout. As with everything in the park, there’s a large variety of angling challenges, with topography ranging from mountainous headwaters harboring trout, to slower and larger cool-water streams for bass. Generally spring is a great time for fishing throughout the park, while the heat of the summer means more limited, upstream work. Fall and the returning cool open the fishing again, and all through winter there are some great opportunities for peaceful and rewarding fishing. You can fish anywhere you can find a stream, unless rangers have the area marked off at the time, for various reasons. There’s no charge to fish in the park, but you’ll need a state license – not available in the park, but you can purchase one online at the Tennessee and North Carolina websites. The best places to fish depend on your skill and your objective – studying a guide book or hiring a local guide may be the best way to consider all the opportunities. In general, the further away from the roads you get, the less you’ll run into other anglers. You can buy or rent tackle, as well as hire guides, from local outfitters such as Smoky Mountain Angler in Gatlinburg and Rocky Top Outfitters in Pigeon Forge. It’s worth knowing also that Gatlinburg actually stocks its local streams with trout, and has 2 designated kid-safe areas to fish, if you’re looking for a family-friendly place to get the kids started on the world’s best sport! See our Fishing in Gatlinburg page for details. 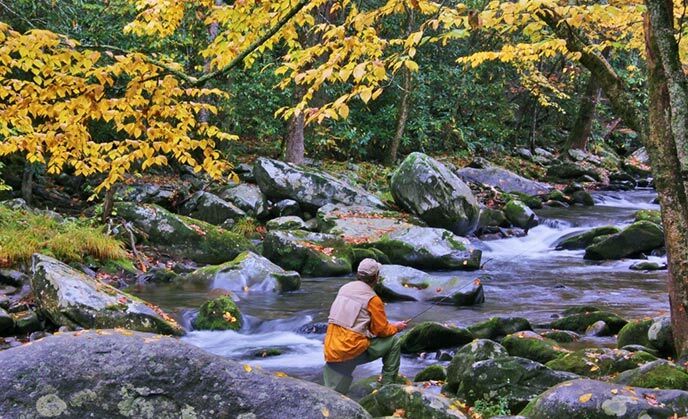 To learn more about the requirements for fishing in Great Smoky Mountains National Park, see the park’s Fishing page. The daily limit on trout of the correct size is 5, and 20 bass. You can only fish using a hand-held rod, and artificial lures – with a single hook, no multiple hooks. The park encourages best practices to preserve the lives of fish that you’ll have to release – which happens frequently, either from under-size or over-limit fish. Play a fish as rapidly as possible, do not play to total exhaustion. Keep fish in water as much as possible when handling. Handle fish with a wet hand, even when using a mesh landing net. Remove hook gently; do not squeeze fish or put fingers in gills. Use long-nosed pliers to back the hook out gently. Use of barb-less hooks is encouraged. If deeply hooked, cut the line, do not pull the hook out. Gently hold fish upright facing upstream and move slowly back and forth in the water. Release fish in quiet water. Finally, be sure to check out and teach your family the basic rules of water safety contained in the park website. It’s always worth remembering that the park is WET. It gets lots of rain and has a vast range of sloping, folded terrain. You can experience sudden surges of very fast water occurring from upstream without any warning or rain in your immediate vicinity. Always keep an eye on the water in Great Smoky Mountains National Park – drowning is actually one of the larger hazards in the park. The park is slippery when wet! Be careful on rocks, along riverbanks and by waterfalls. Aside from fishing, immersive water sports are not encouraged in the park. The streams are best left to the photographer, the hiker – and the ever-prudent angler!